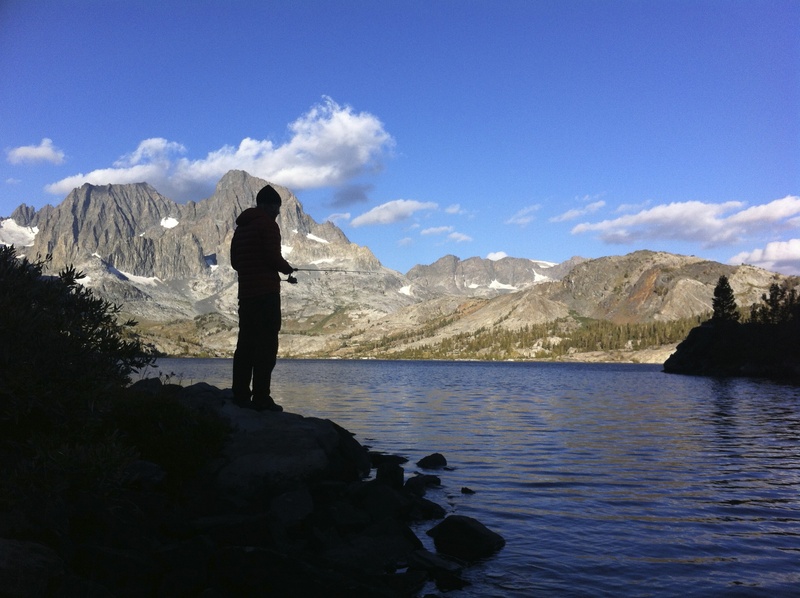 I am a graduate student at UC Berkeley during the week, and an adventurer on the weekends. It is these adventures that are the focus here. This is an on going collection of trip reports from my various excursions. 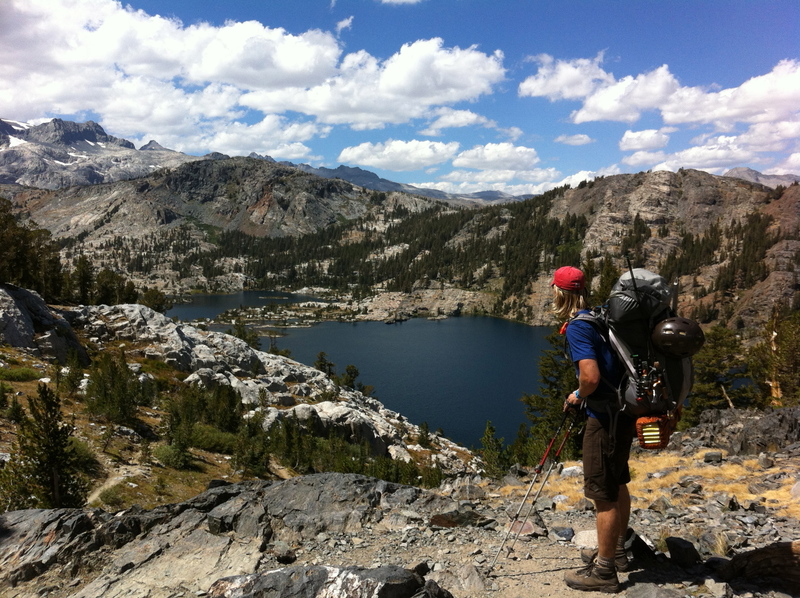 Everything from hiking and backpacking to rock climbing and bike racing. A word on the origin of 'Country' Kyle: Shortly after joining Cal Cycling, I found myself sitting in a car returning to Berkeley from a bike race joking with friends about having 5 or 6 different 'Kyles' on the team. This led to the need for some nicknames and since they knew I'm from Southwestern Virginia, the name Country Kyle was born. The snow had adjusted under my weight during the night leaving me with an uncomfortable position for my back and causing me to get up with the sun. 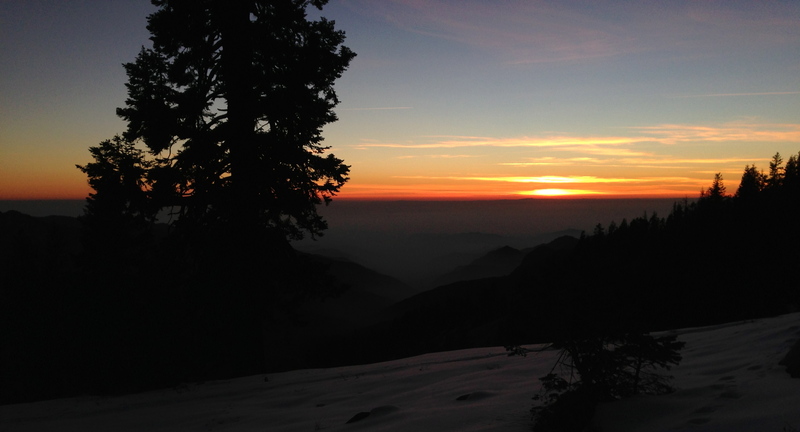 The air was cold as the sun slowly climbed out from behind the ridge, its warmth only reaching us after breakfast. 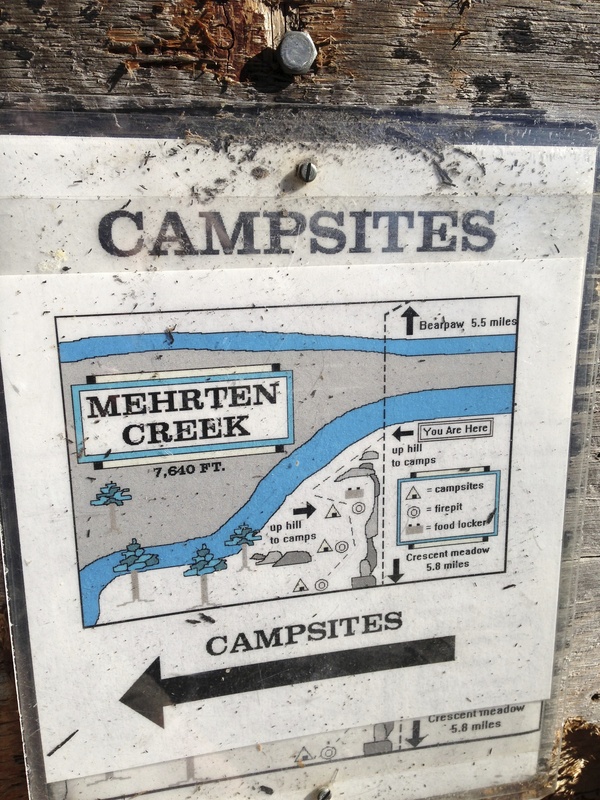 We took our time with breakfast and breaking down camp since we didn’t have far to hike. We were heading towards Wolverton Cutoff, which would take us over the ridge towards the Giant Sequoias and back to the car. The sun had warmed the air significantly by the time we started down the trail at about 10 AM. 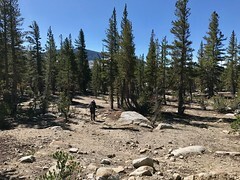 We backtracked 2.2 miles towards the Merhtan Creek trail split, then descended another 2.2 miles to the High Sierra Trail. We quickly dropped below snow line and the trail became wet with snow melt. 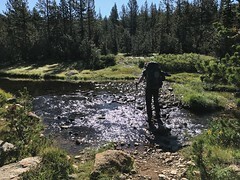 The High Sierra trail brought us to a rocky clearing where it crossed Merhtan Creek. The warm rocks were a nice spot to have lunch and let the boots and socks dry in the sun. There are also some camping spots tucked away in the trees above the trail complete with fire rings and bear boxes. After lunch we took on a full load of water since we would be camping on a ridge with no streams this night. Continuing down the trail, and down in elevation, we wound our way through wooded hillside for about 3 miles before climbing again on the Wolverton Cutoff trail. We climbed a short ways to the top of the ridge where we made camp for the night. Some day hikers were taking in a view of the valley from a rock out cropping nearby. As the sun light faded, we made a small camp fire for about an hour after dinner. The temperature was a little below 50°F and didn’t drop too much after dark, and sitting by a fire was a nice change from going strait to bed after dinner. The night was pleasant with the temperature never getting close to freezing, and the morning was comfortable for breakfast. 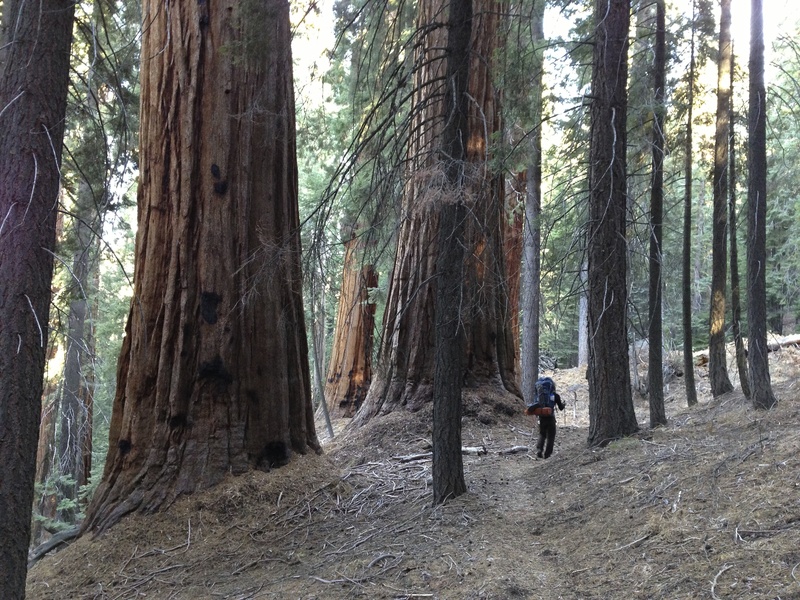 After breaking camp and hitting the trail, we quickly dropped into the Giant Forest. 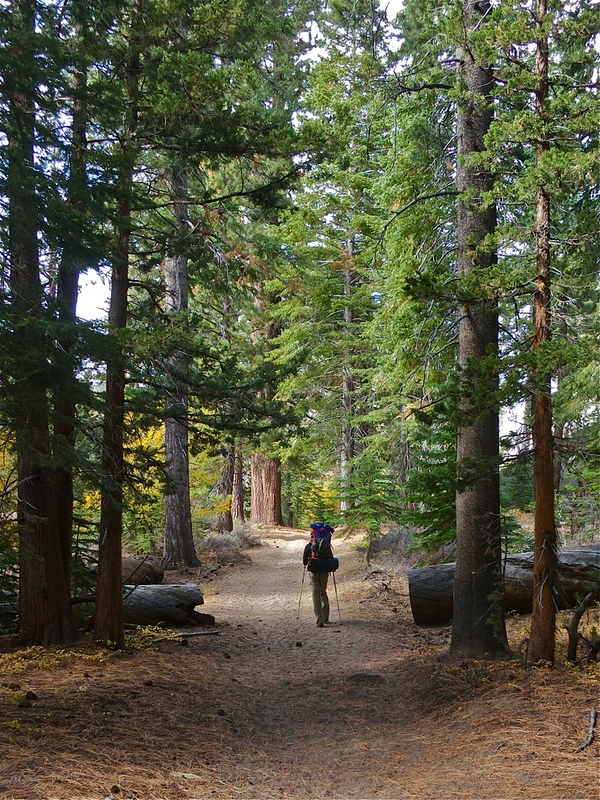 My pace slowed as I stubbled over sticks every few steps, my eyes gazing upwards focused on the trees towering above. Looking around at eye level, you could almost forget these were trees and not giant columns holding up the sky. It was only a few miles back to the car. 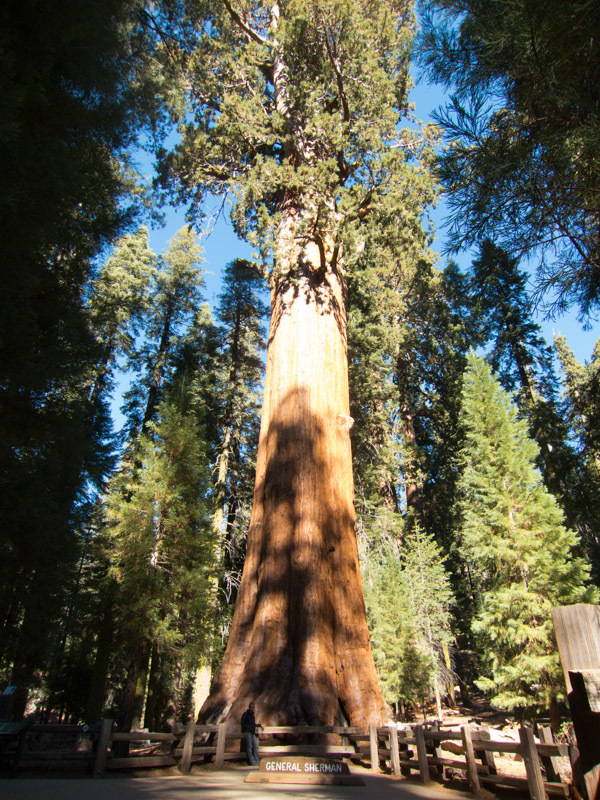 We arrived before lunch, then made the short drive down the road to go visit the biggest of the giants, General Sherman. After doing several strenuous trips, it was time for something more relaxed. For this we made our way down to Sequoia National Park to spend Thanksgiving wandering the mountains among giants. 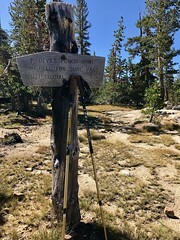 We had mapped out a 4 day loop from Wolverton that would take us up to the summit of Alta Peak then down through the Giant Sequoias. Leaving the Bay Area around 5am, we were on the trail by 10am. 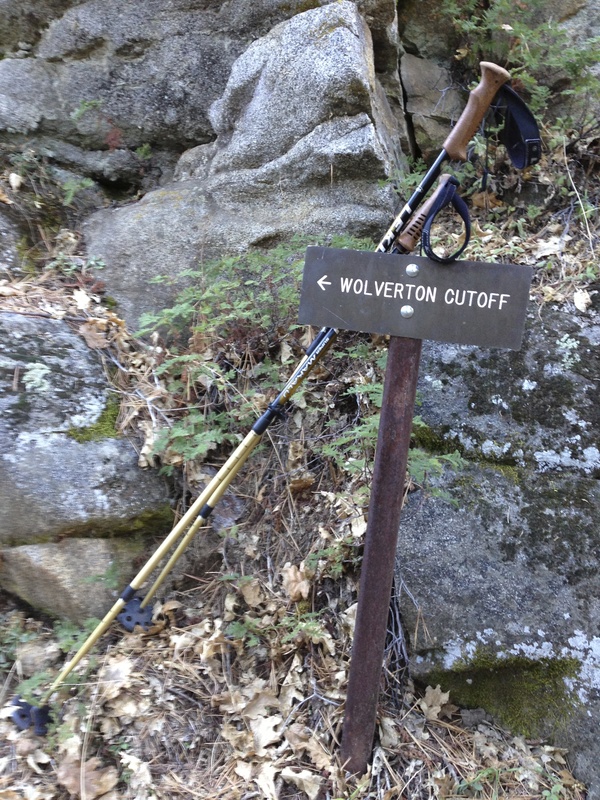 The trail from Wolverton took us up the northern side of the ridge to Panther gap. The ground was covered by a crusty layer of snow that had been well traveled. 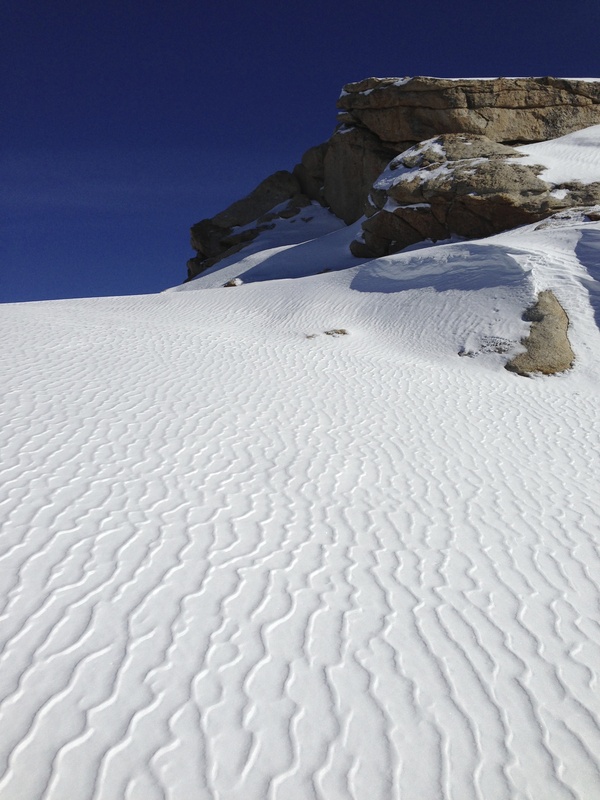 The snow gave way to dirt as we crested the ridge into the warmth of the sun hitting the southern slope. 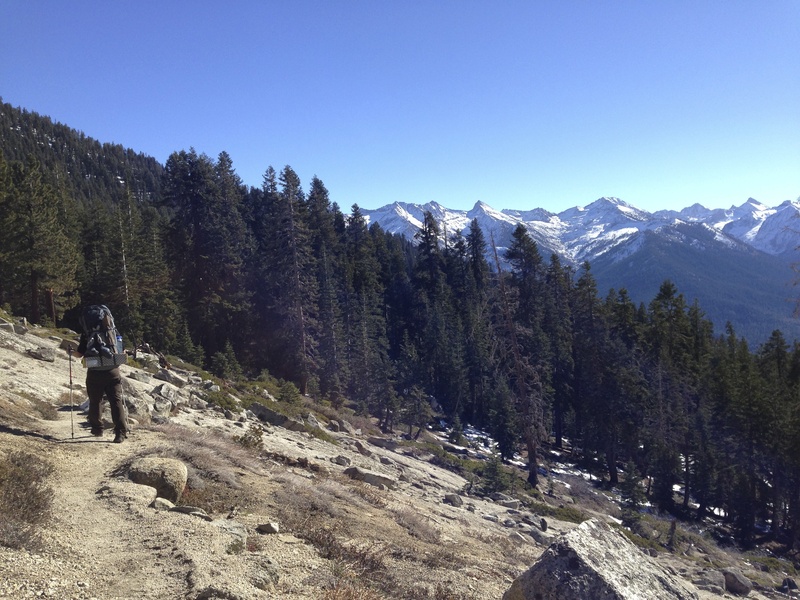 Here the trail turned East towards Alta Meadow, but before continuing on, it was time for lunch. After lunch we made our way along the ridge towards Alta Meadows. All day we were following the tracks of hikers that preceded us. At the Alta Peak trail split, the tracks continued up towards the peak, however, we turned towards Alta Meadows and began putting in first tracks in about 5 inches of snow. After about a mile, we stopped and made camp on the ridge overlooking the meadow. Here we had a beautiful view of the valley dropping below us to the west, and the snow capped mountains to the east. We also had good access to a small stream running down the side of the ridge. The sun was setting by the time we got settled into camp. The temperature had dropped, and the snow was already forming a crust as we wandered up the slope from camp a short ways to take in the view. The sky was filled vivid shades of red and orange as the sun descended into the valley, but as the sun dropped, so did the temperature. I had slept fairly well through the night, waking only a couple times to adjust as I gradually sunk into the snow during the night. Just before dawn, I woke to a pack of coyotes howling in the distance. It sounded like a fairly large group. 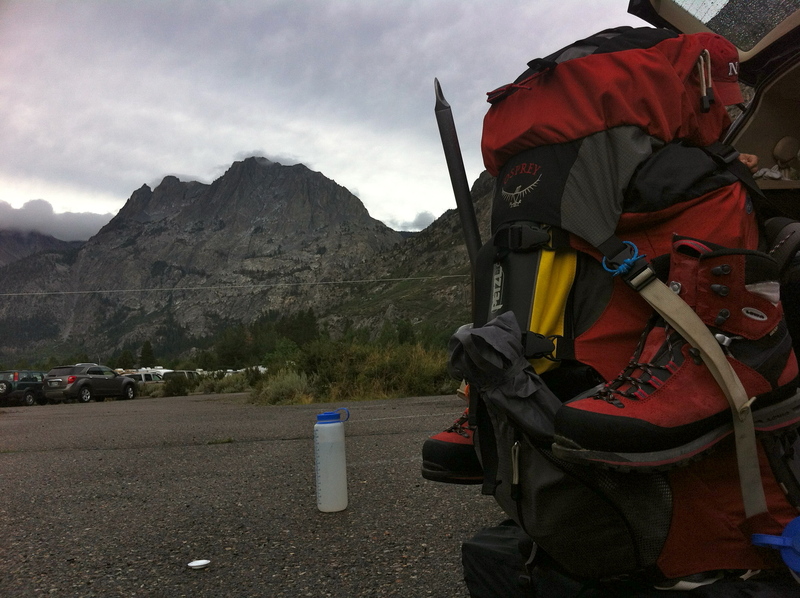 Our plan for the day was to base camp at Alta Meadows and take day packs to the summit. As we made our way out of camp, we noticed several sets of tracks passing by our camp. Looked like the coyotes had made there way right by us in the early morning light! The trail started off at a gradual climb, but as we climbed, so did the temperature. It was around 70°F by 11AM as we approached the base of Tharp’s Rock. We had been following tracks in the snow, but they ended here. Continuing on, we began post-holing up the mile to the summit. It was much slower going without tracks to follow. The snow was knee deep, and the crust on top was just strong enough to hold my weight for a second before breaking and dropping my foot to the ground. This cycle repeated with every step… It was quite tiring. After an hour of tiresome post-holing we made the summit! The true summit was a large sloping rock about 4ft above where we were standing. To get to it involved stepping out on a narrow, icy, rock ledge. The ledge wasn’t too high, but it wouldn’t be pleasant if you were to slip off, so we decided not to risk it. Even though we didn’t stand on the summit I could touch it, so I’m counting this one as summited! There was a bare rock just below the summit that we had a late lunch on. We were the only ones on the mountain, and it was quite. Not even a gentle breeze whistled in our ears. The descent was quick but hot. When we left the summit at 1:45PM it was 80°F! By 4PM we were back at camp where there was noticeably less snow. But as the sun set, the temperature dropped, and I could tell it was going to be colder than the previous night. Kennedy Meadows was a picturesque scene, a mountain stream running through the meadow with patches of colorful fall Aspen dotting the hill sides. 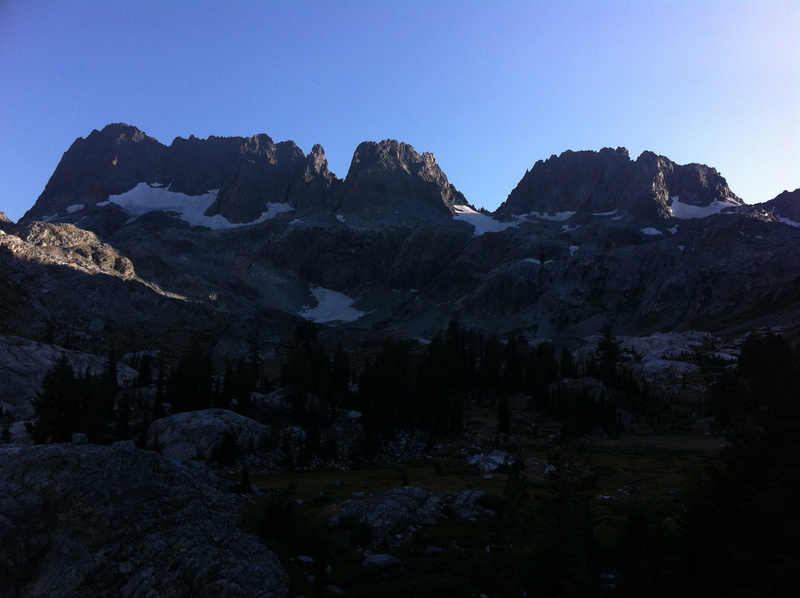 We started up the trail from Kennedy Meadows towards Granite Dome at 8:00 am. On the drive up we had joked that our bear encounters were increasing in significance; seeing more tracks more often, then driving up on a bear crossing the road during our last trip to Ansel Adams Wilderness. It could be this trip that we get our first in-person encounter. 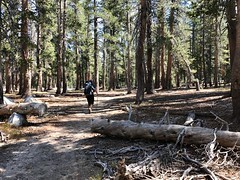 Sure enough, about a half mile up the trail I spotted a large animal lumbering through the trees about 30 yards ahead. It was a large brown bear! After stopping to watch the bear run off into the woods, we continued hiking. The trail climbed along the side of a deep ravine with water crashing below. Above the ravine we began traversing a ridge that took us past Relief Reservoir. Here, the slopes were dotted with more patches of bright yellow Aspen. As we continued past Relief Reservoir towards Saucer Meadows we heard a loud rustle in the trees. We looked over to see a brown bear tumble out of a tree, run up the slope, then climb up another tree. A second bear! And again, not 30 yards away! Continuing on, we stopped for lunch a little after noon. We were a short distance from where we would be getting off the main trail to head towards Ridge Lake at the base of Granite Dome’s north face. We left the main trail about halfway between the trail split after Relief Reservoir and Sheep Camp. 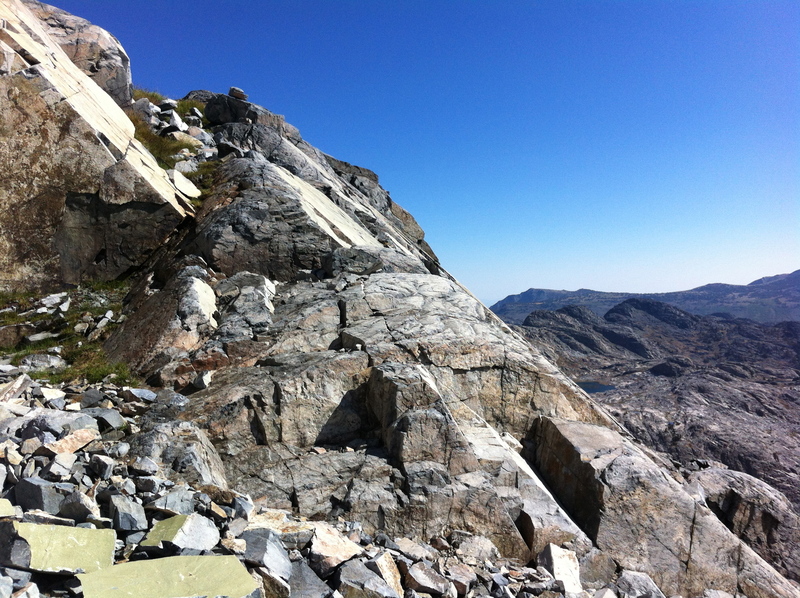 After leaving the trail, we made our way up steep granite slab. This significantly reduced our pace. Moving across the granite slab took some navigation skills as our landmarks kept disappearing behind the ridge lines as we moved. But we knew the general direction we needed to go, and kept moving. 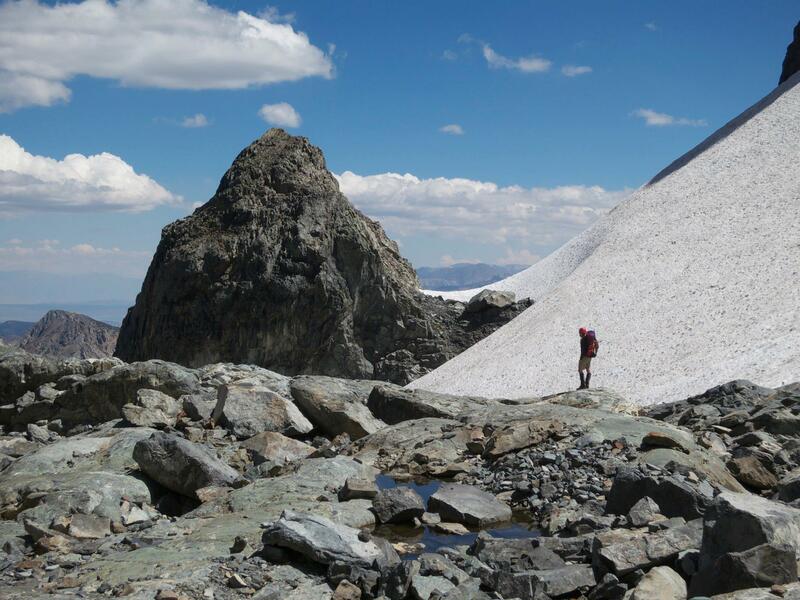 As we approached the first pass, we spotted several cairns that led us up and over as the rock became steeper. From the top of the pass we got our first look at the summit of Granite Dome. It looked far away and our path was not a strait one. 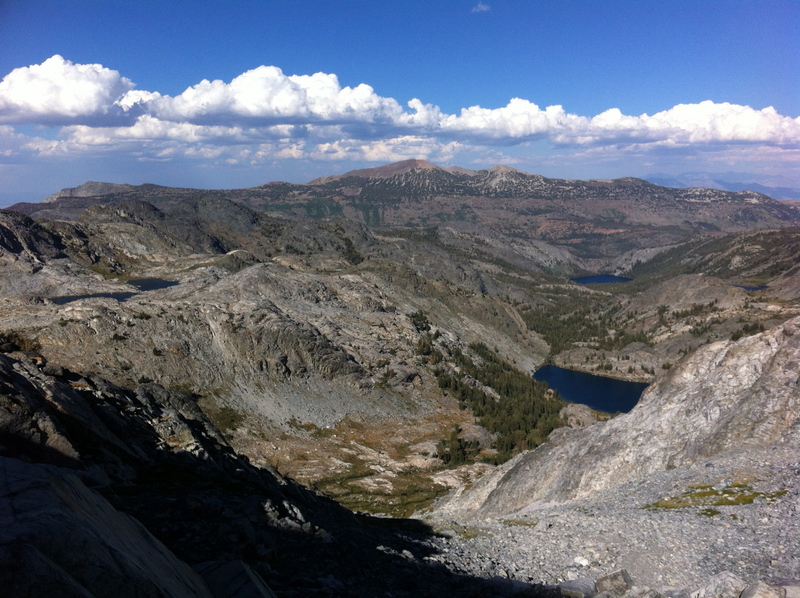 We first had to get to Ridge Lake before heading around the lake to access the dome’s eastern slope. It was now 2:00pm and we realized that we would probably not be making it to the summit today. After cresting two more ridges, we finally spotted the lake. 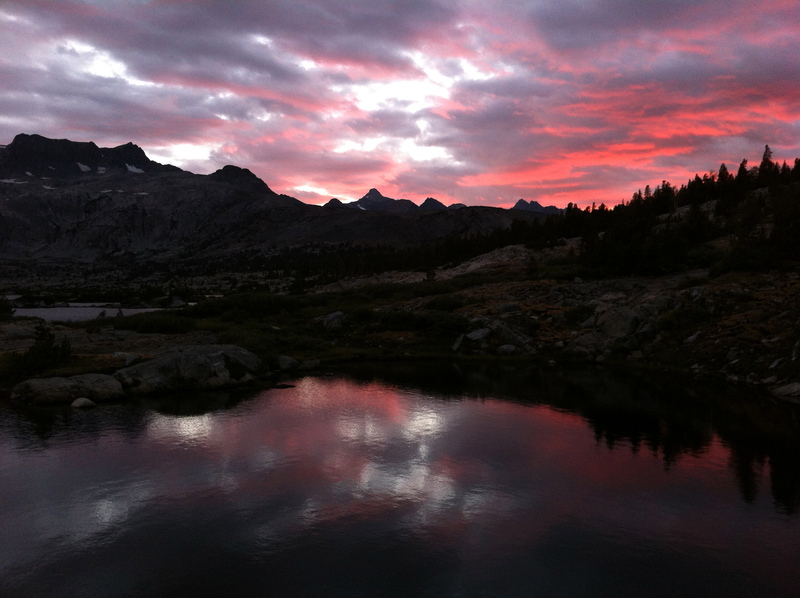 The shadow of Granite Dome had already shrouded half the lake in shade as the daylight began to fade. We decided to camp here and try for the summit in the morning. 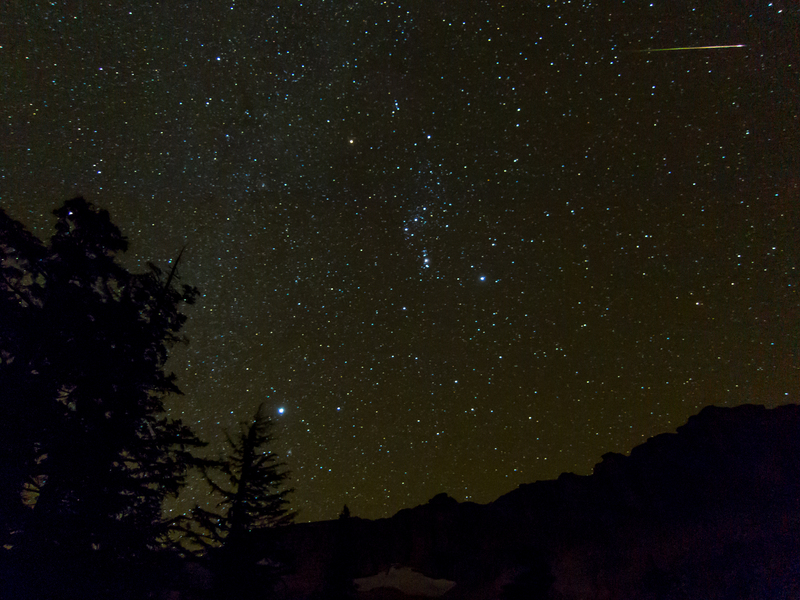 The night was windy, but the sky was clear and Orion was high above. We watched the sky for about an hour and were treated to quite the show! There were streaks of light crossing the sky every minute! By 4am it was time to get back in the sleeping bag and warm up. In a few hours it would be time to hike again. Morning came quickly. By 7am we were up making breakfast. We had decided to take day packs to the summit and grab the tent on the way out. Heading east around the cliffs of Granite Dome’s north face. This path was more boulder scrambling that the previous day. Progress was slow. After cresting several ridges, we finally got a view of where we had to go to get around the cliffs. It was still a ways off, and with clouds starting to roll in, we decided to head back to the cars. 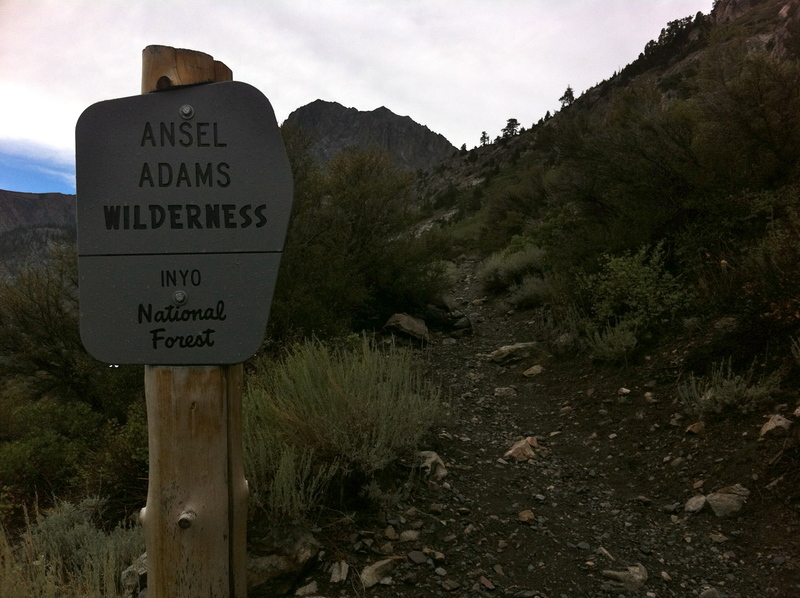 The return trip was fairly uneventful other than passing a pair of hikers heading into the wilderness. We were back at the car by 4:30pm. I took a look at the weather report for Emigrant. It had snowed several inches over night with 80mph winds and more snow in line for today and Sonora Pass was closed. I think it was a good thing we turned around when we did! I woke up at 4am to Paul’s alarm. He moved just enough to shut it off and I wondered if he would have the motivation to get up and hike to the other side of the lake for some fishing like he had planned… No movement. At about 5am I woke up again, this time to his headlamp. He had convinced himself to go fishing, and I began debating whether or not to find a spot with a view of the mountains to watch the sunrise. It was still dark, but I decided that if I was still awake in half an hour I would do it… I was still awake. In the dark I climbed to a place I had found the previous day with a great view of the Minarets. The sunrise was spectacular! After the sunrise I made my way back to camp where I was joined by Paul. He, once again, returned from fishing empty handed. 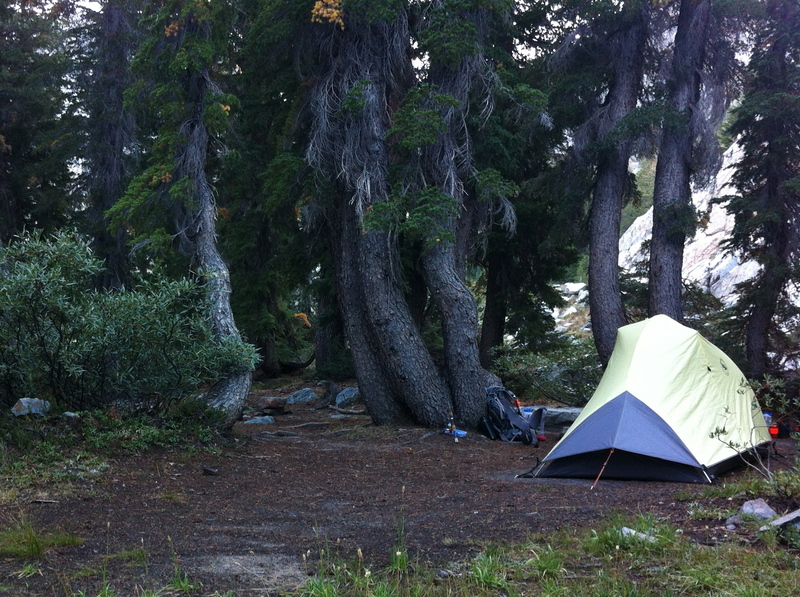 We took our time with breakfast and packing up camp since we were only going 5.5 miles to Garnet Lake. While we were cooking, the two hikers we had seen on Mt Ritter the day before walked by our camp and talked for a bit. They had climbed the lower cliffs route as I suspected. After a couple of unsuccessful hours of fishing, we returned to camp for some dinner. Disappointed that he didn’t have fresh fish for dinner, Paul went back for a second try as the sun was setting. Another half-hour of nothing and he was ready to call it a night, “Just one more throw.” Apparently that little statement was all it took. He hooked one! With the sun gone and the stars out, it was time to call it a night. We awoke to a fairly cool, but clear, morning. The sun was climbing quickly as we made breakfast, but our camp was in the shadow of the ridge, so it was quite late in the morning before we felt the warmth of the sun’s rays. We had about 7 miles to hike back to the car taking a slightly different path than we took on day one. 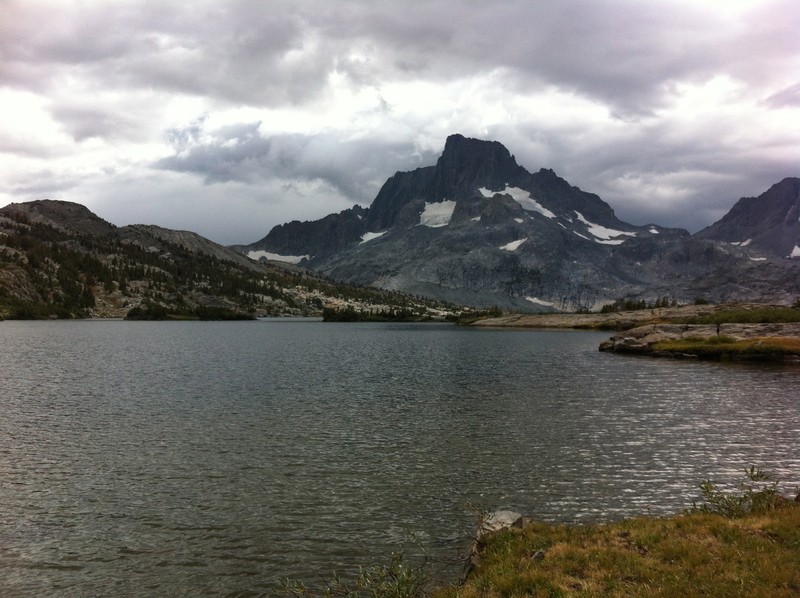 We hiked directly to Agnew lake rather than repeating the loop around Gem lake. But before leaving camp, Paul got in one more round of fishing. We returned to Agnew lake through Spooky Meadow. The scenery here was different than any we had seen so far. The gray granite had been replaced by reddish lava rock and the meadow itself was strangely calm for how windy it was elsewhere on the trail. Leaving the meadow started us on a grueling 3,000ft descent over a short 3 miles of trail. By the end of the hike my feet and knees were sick of walking on the unsteady, fist-sized rocks that covered the trail. I was definitely glad to have not come up this route on day one. Back at the car we celebrated a fun trip. Even though we didn’t reach our target summits, we returned from 5 days in the back country safely with plenty of good stories and pictures. See more photos on Flikr! Be sure to check out the first 3 days of the trip! The plan was to get up at 6:00am and be on the trail by 7:00am. Unfortunately, Paul’s watch alarm wasn’t loud enough to be heard outside of his sleeping bag. Despite this, we were on our way up the approach trail by 7:30am. 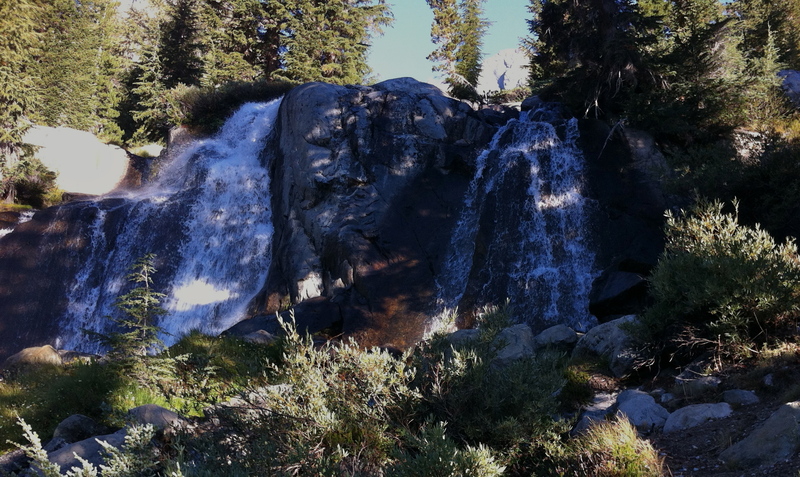 The trail made its way up to the R/B valley along a small stream that tumbled down many beautiful waterfalls. We made it to the upper valley by 8:00am and made our way towards the lower chute. The sky was clear and we were already feeling the heat of the morning sun as we started up the chute. The chute quickly steepened to class 2 as we climbed up the scree. It wasn’t too loose, though the occasional small rock would take a short tumble. 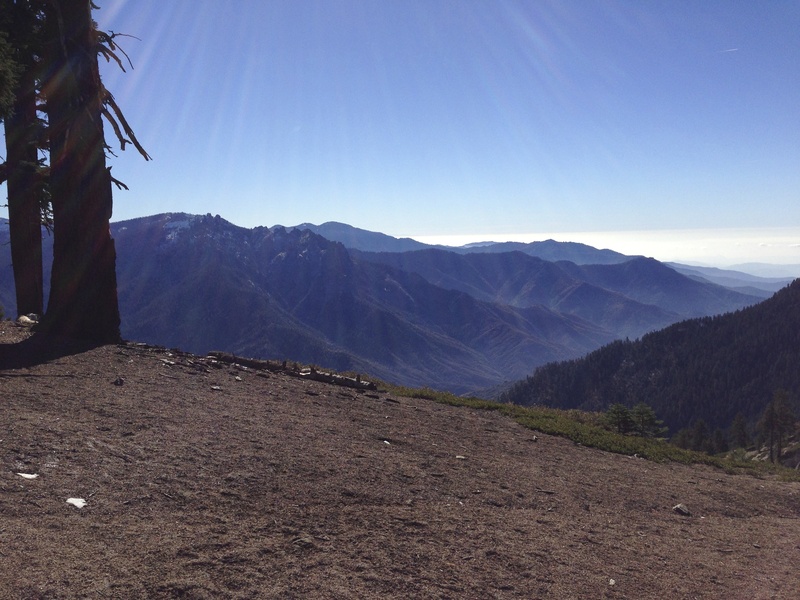 We gained elevation quickly, and before long spotted our first landmark, the “tree rock”. Our route description said to avoid this and continue climbing. 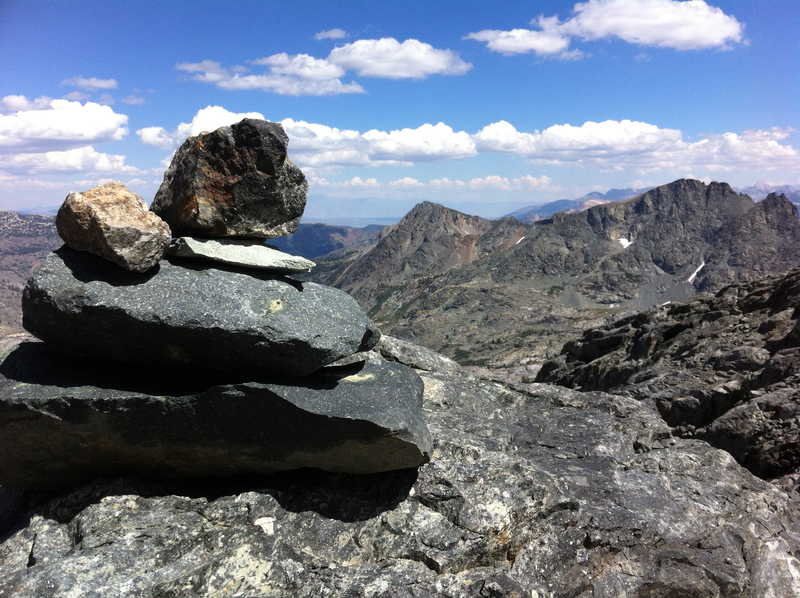 A short ways above the “tree rock” I spotted a cairn on a ledge above us. We suspected this to be where we were to exit the chute, and sure enough, it led us to a nice grassy ledge. Traversing the grass ledge brought us into view of the SE pinnacle. From here we could scout our route, contouring beneath the pinnacle. Our traverse under the pinnacle (just above 11,000ft) brought us across the first snow field of the climb. Crampons made crossing the 100yd stretch of snow fairly quick, but the mountain was very dry, and we were back on rock after only a few minutes. From here we continued around the pinnacle, climbing our way to the base of Mt Ritter’s SE glacier. The sound of running water filled the air. We were surrounded by several streams flowing down the mountain from the base of the glacier. 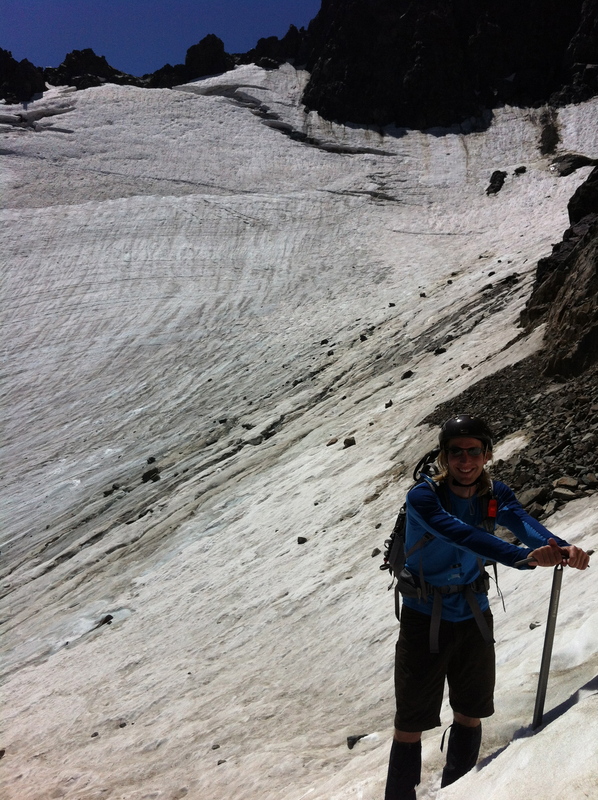 At the base of the SE glacier, we found ourselves standing on a large rocky plateau. With Mt Ritter and the glacier towering above, and Ediza Lake in the valley below, I couldn’t help but feel like a tiny speck on the side of this mighty mountain. The glacier was a light icy blue and covered in dozens of steams flowing down the face. Rock fall had sprinkled the surface with dark boulders of all sizes. Midway up the right side of the glacier were the two chutes that we could take to the summit ridge. From route descriptions, Owens chute sounded like the easier climb, but with the low snow level, there was a significant stretch of wet rock slab that looked very slick. Below Owens chute was Secors chute. Though it is described as being a steeper climb, it wasn’t blocked by streams and slick rock. Before continuing our climb, we stopped for a quick lunch. While sitting, we heard a loud crash come from high above. Looking to the top left of the glacier, we spotted a large rock, maybe the size of a dog house, take a pitch off the ridge and come bouncing and sliding down the face of the glacier! Fortunately we were not directly beneath its path, though it made its way fairly close to where we had been climbing up about half an hour earlier. After lunch we loaded up and began the climb towards Secors chute. The snow increased in steepness as we approached the base of the chute. Here, at the bottom of the chute, the snow stopped. We looked for a good place to get off the snow, but the chute was filled with very loose rock. I took two steps off the snow and could barely get purchase on the loose rock, sliding back towards the snow. Another step nearly kicked loose a large rock. Back at our lunch spot, we decided to try and descend the lower cliff via the grassy ledge route. We spotted a cairn to the left of the left-most stream, as mentioned by the route description, and made our way towards it. This led us to a second, and then a third cairn! I was feeling good about this descent until we reached the third cairn. We were standing atop a cliff with no apparent way down. The route was supposed to be class 2 the whole way, but we were looking at a whole lot of class 4. After looking at the pictures and a bit of debating, we determined that the cairns had led us to far over to be standing atop the lower cliffs. Because of the warmer season and quickly melting glacier, the left-most stream we had followed may not be there during normal years. We had to turn back. It was now mid afternoon, and rather than continuing our route finding towards the lower cliffs, we returned the way we came. After traversing back under the SE Pinnacle, we spotted two people sitting on a grassy ledge below. They were tiny figures giving a grand perspective of the valley far below. Continuing across the mountain, we returned to the chute we had climbed at the start of the day. From here the descent was strait forward. Back on the valley floor we ditched the helmets and made our way back to camp. It was good to be back and get the boots off. A day of climbing over rocks had taken a toll on my feet. On the descent we got a good look at the upper chute leading to the Ritter-Banner saddle. The snow did not go all the way to the top of this chute either. Thinking that it would lead us to more steep, loose rock like today, we decided not to attempt Banner the following day. Instead we would take two easy days before heading back to reality in the Bay Area. Continue reading with Days 4 & 5 HERE! Be sure to check out Days 1 & 2 of this adventure! I awoke around 6am. The night had been fairly warm and I had slept on top of my sleeping bag for most of the night. The lake was still and the sky clear, and even though it was early, I could already tell it was going to be a hot day. We took our time getting out of camp since we were only going ~7.5 miles to Ediza Lake and had minimal elevation change along the way. I made a hash-brown and egg scramble for breakfast, and we hit the trail by 9:30am. 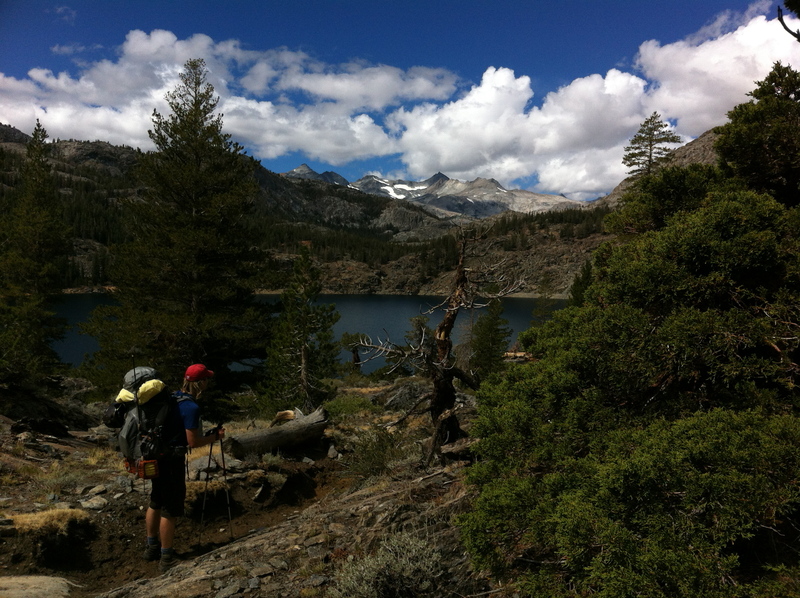 We followed the JMT to Garnet Lake. 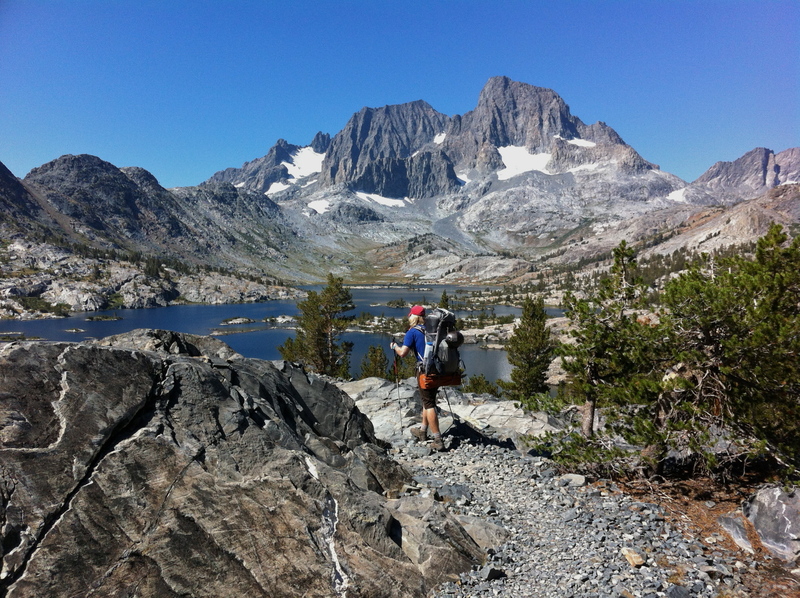 The JMT had a fair amount of traffic on it and we were passing people regularly. Many of the hikers were traveling with dogs, and one group was guiding a couple of goats along the trail! At 11:00am we arrived at Garnet Lake where a couple people were taking a morning dip. We stopped at the lake outlet to have an early lunch and re-apply some much needed sunscreen. 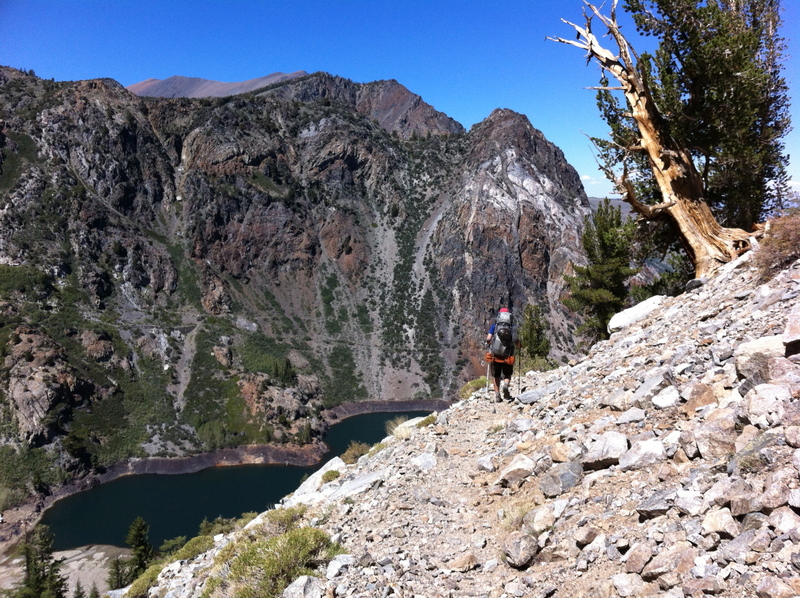 Continuing past Garnet Lake, we made our way over the next ridge towards Ediza Lake. Here we came across several groups that had come up from Agnew Meadows. When we arrived at Ediza Lake it was about 3:00pm, and there were many tents visible along the opposite shoreline. We circled around the lake and worked our way up a stream towards the valley at the base of Ritter. While our camp was nestled in the trees giving us almost no view of the mountains, the trail around the lake offered a spectacular site! Our camp this night was away from the lake but not far from a stream of glacier melt. The water was ice cold and refreshing! 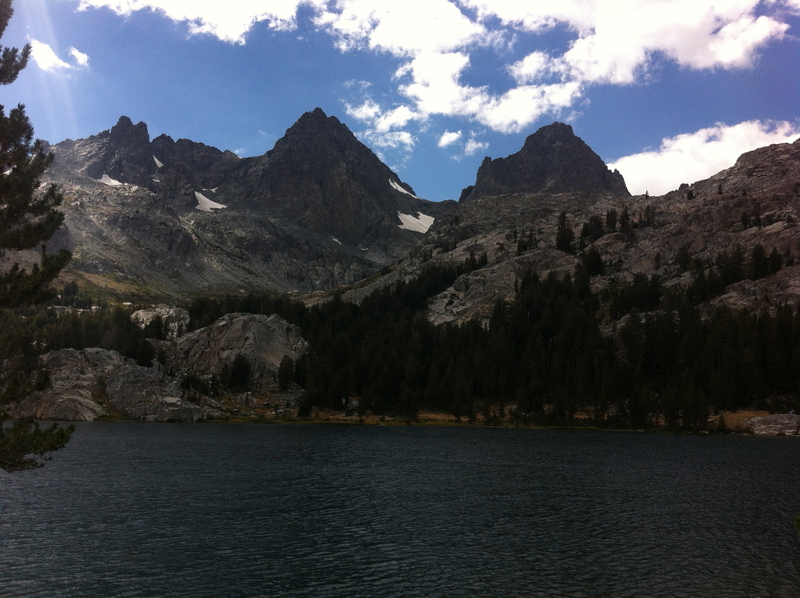 The camp had an established fire ring, and the rock ledge above offered more tent spots as well as a great view of the Minarets. By 4:30pm we had the tent up. 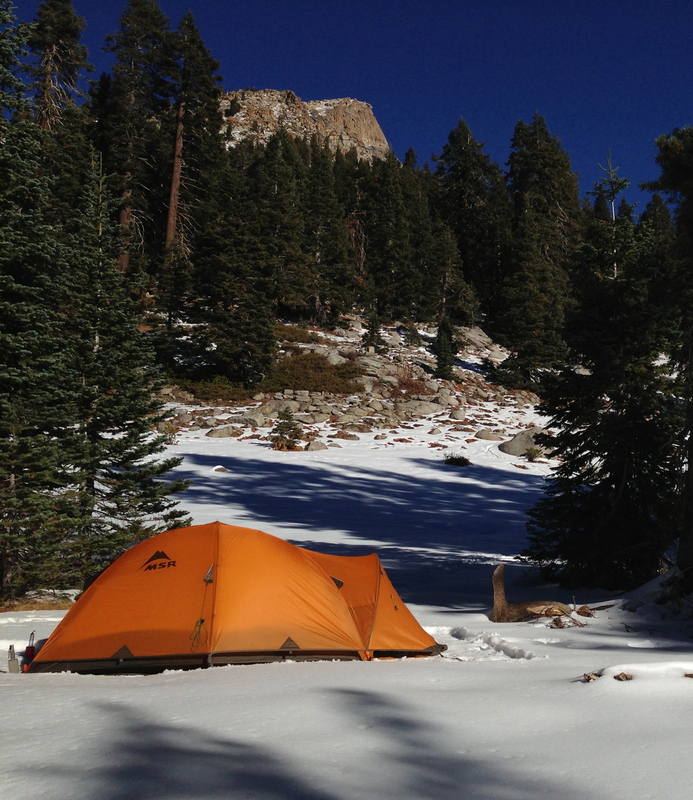 We were near 9,500ft, and while there were quite a few people by the lake, our camp felt a world away. I found a spot near camp from which I could see our route up Mt Ritter. The mountain was very dry with little snow covering the route. From here, the SE glacier and the chutes that would take us to the summit ridge were obscured by the SE pinnacle, so we would have to wait until the next day to see what the conditions were like up there. The day had been quite warm, and much of our hike had been exposed. Now that we were in the trees and the sun was setting, the temperature began to drop. Nothing too cold, but definitely enough to make me dig out my down jacket and fuzzy hat as I began to prepare dinner. The menu this night was a new dried chili mix I had found to take the place of the pizza I couldn’t make due to the fire ban. It took almost half an hour of simmering to hydrate (probably because of the altitude), but I added some peppered jerky and cheese to the mix, and it was quite tasty and very filling! 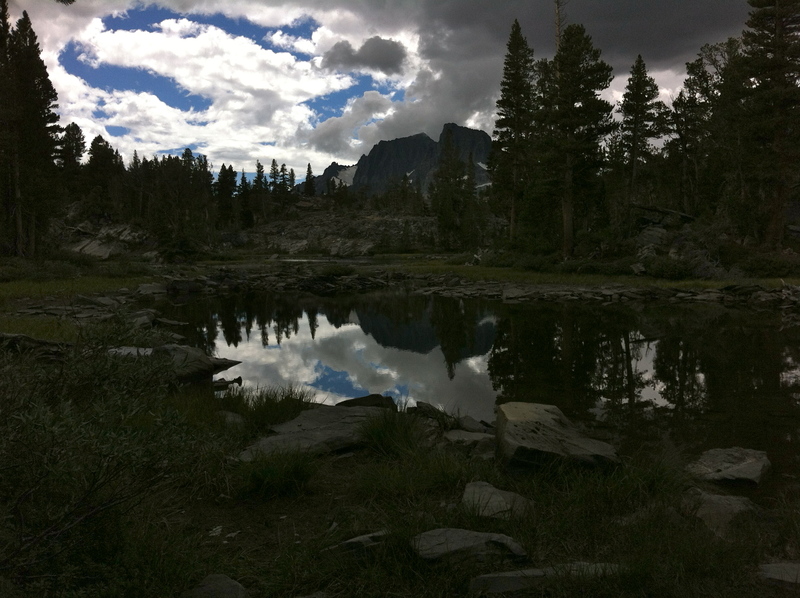 To the southeast of Yosemite National Park is the Ansel Adams Wilderness. 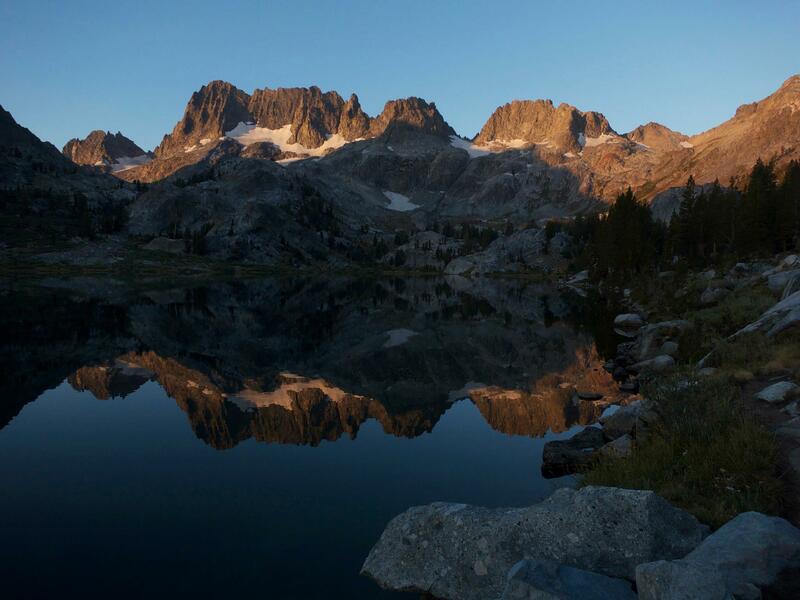 Named after a man known for his black-and-white photography of the Sierra Nevada, this region marks the northern end of the High Sierra. 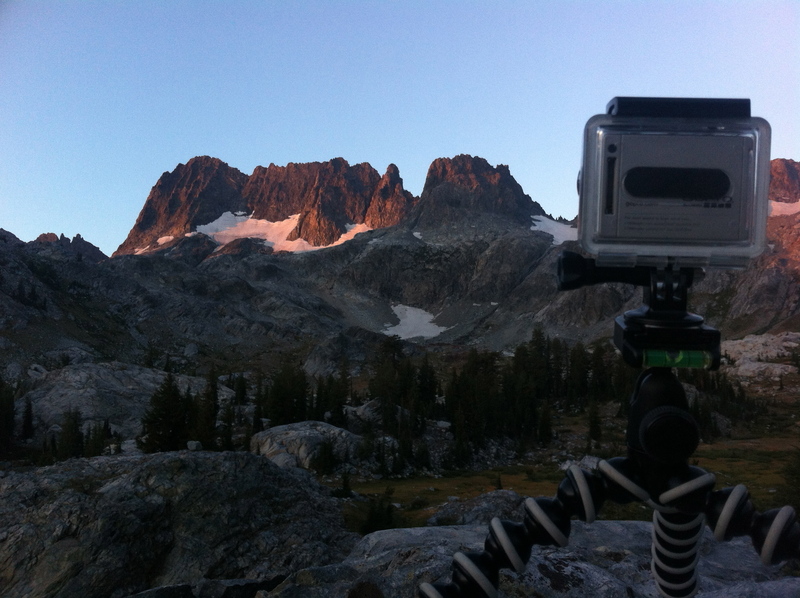 With summer coming to an end, Paul and I set out on a 5 day expedition into the wilderness to climb Mt. 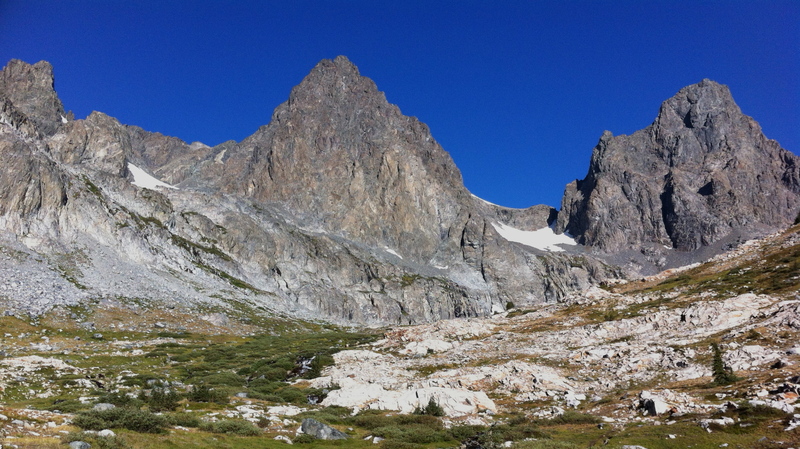 Ritter (13,149ft) and Banner Peak (12,936ft). Leaving the Bay Area after rush hour gave us a fairly uneventful drive down, at least until we reached Tuolumne. Rolling through on Tioga Pass at 10:30pm behind the only other vehicle on the road, we suddenly had lights flashing behind us. A park ranger got Paul for not having a license plate light! After getting a flashlight in the eyes, a brief chat and a warning, we continued on our way. We had to make a quick stop in Mammoth Lakes to grab our permit before heading to the campground at the trail head in Silver Lake. 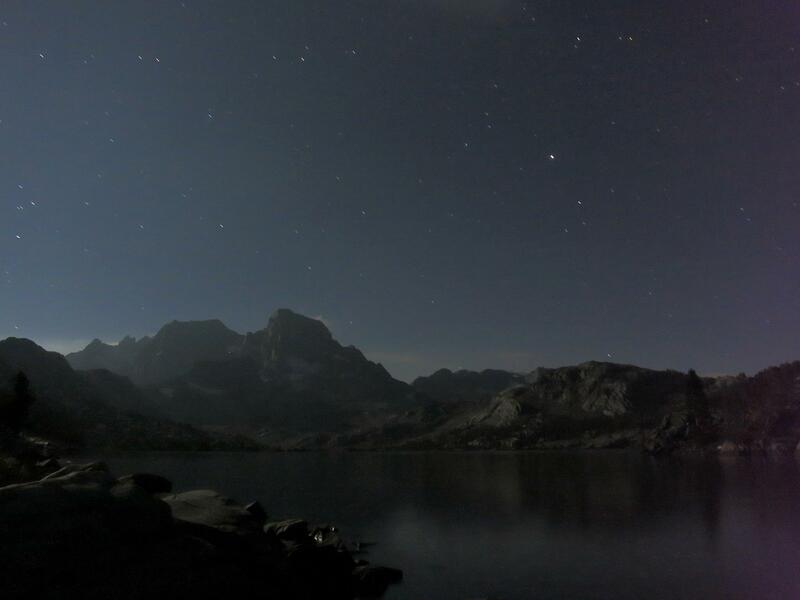 The rangers had left our permit with a warning that there had been a lot of bear activity reported in the area, especially around 1000 Island Lake. We didn’t think to much of this as we made our way to the campground until we came up on a bear taking a midnight stroll across the road! We rolled into camp shortly after midnight and were treated to a light show by the storm clouds circling the valley. It was quite the site! It rained through the night and I awoke shortly after 6am to the sound of a generator. The park’n pitch campground we had pulled into was largely populated by RVs and our neighbor was apparently an early riser. With wet grass and puddles all around, we pilled our gear into the car and headed to the trailhead parking lot to repack and get on the trail. We started up the Rush Creek trail shortly after 8am and immediately began to climb a fairly steep grade. 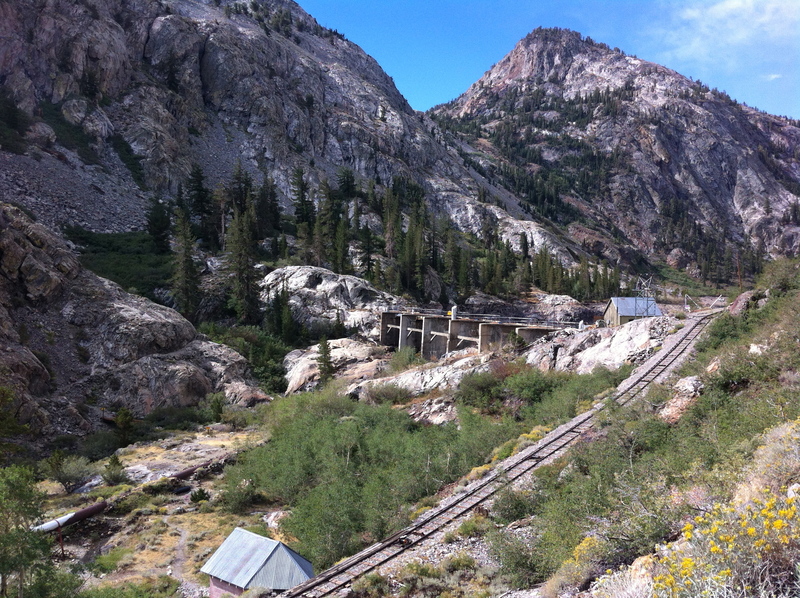 The trail criss-crossed the tracks for a cable tram that went strait up the side of valley to the dams that created Agnew and Gem Lakes. There was no cable on the tracks and I wondered if the tracks we still used. 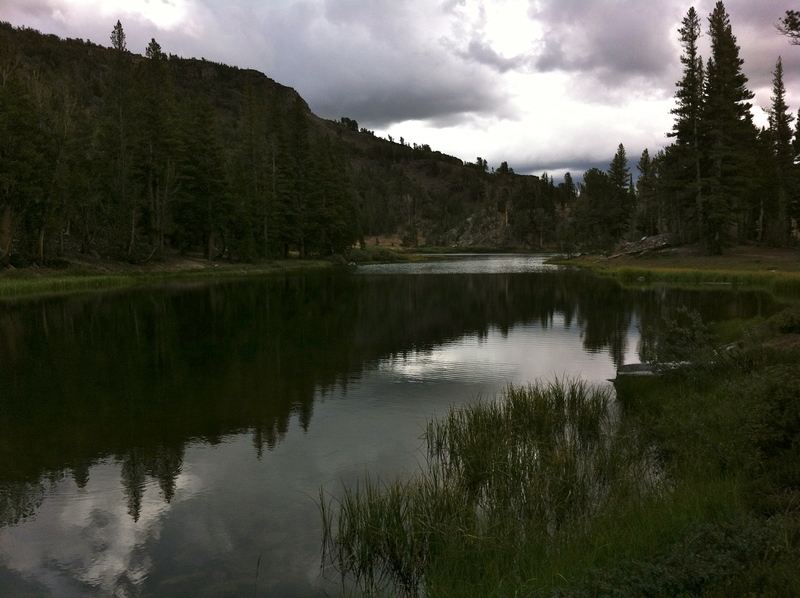 As we neared Agnew Lake, we began to hear sounds of hammers and drills. Agnew Lake had been drained for repairs to the dam and the cable tram was how supplies were carried up from the valley below. We continued past Agnew Lake towards Gem lake. The clouds had cleared, and we hiking under a brilliant blue sky. 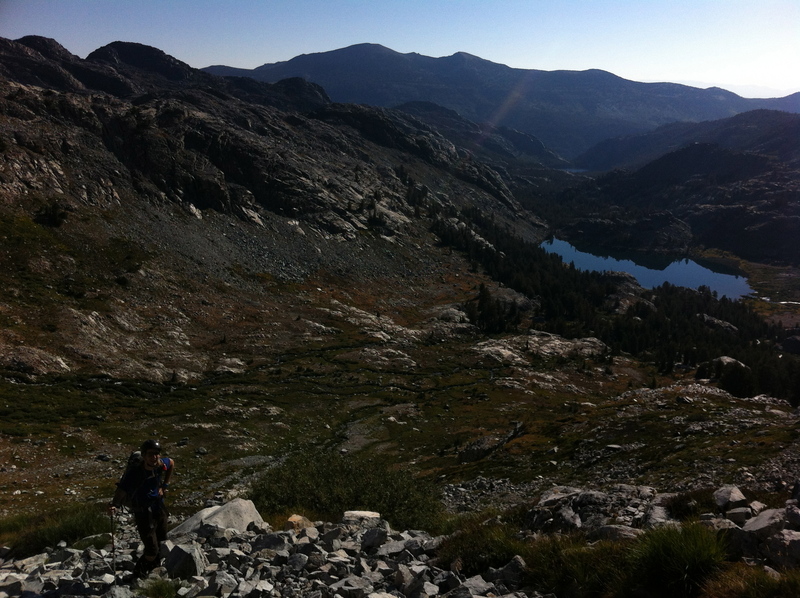 As we crested the ridge at Gem lake, we got our first glimpse of the High Sierra! Continuing around the lake, we found a place to grab lunch. 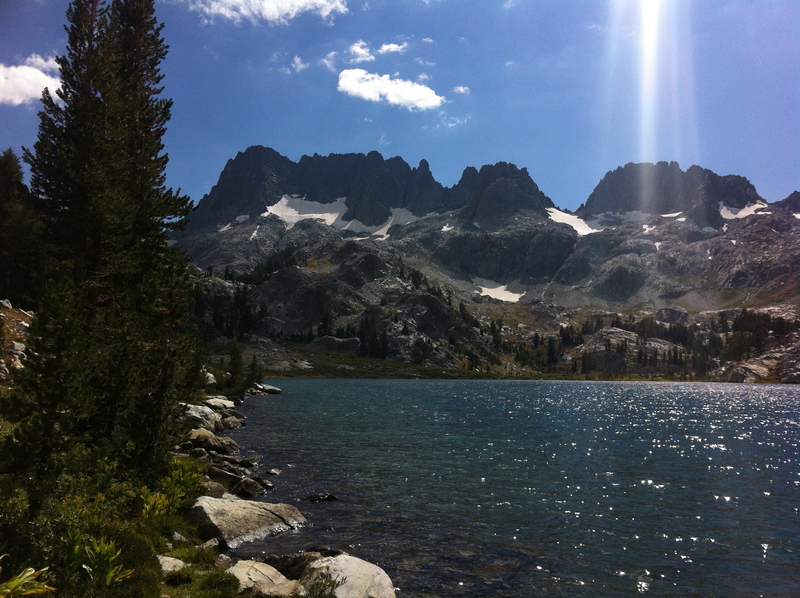 It was about noon, and we had climbed about 2,000ft… it was a well deserved meal. After lunch we turned away from Gem Lake, and continued to climb towards Clark Lakes, a group of several small lakes at 9,800ft. It was now around 2pm and a layer of dark clouds had moved back in. We decided to pick up our pace a bit incase these clouds were bringing another evening of rain. Just past the Clark Lakes we crossed our first pass of the trip at ~9,900ft. 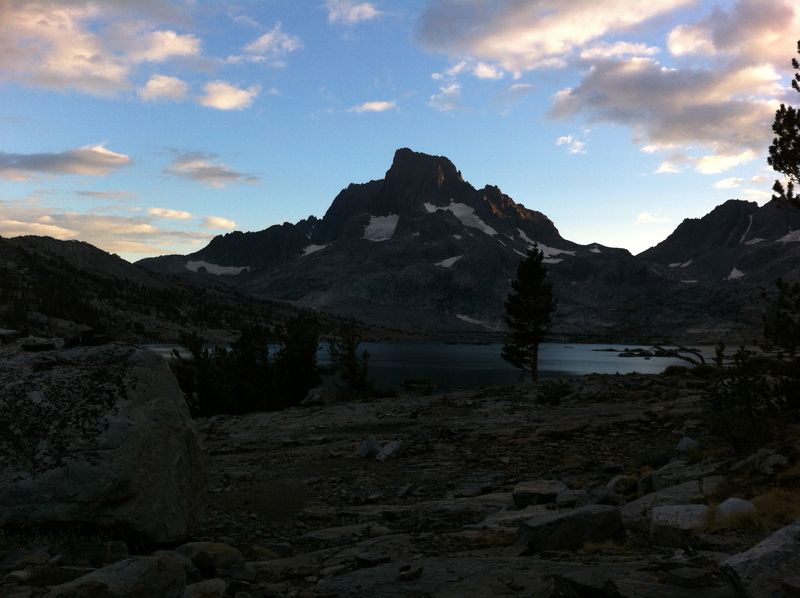 From here we got our first look at the reason we had come into the wilderness… Mt Ritter and Banner Peak. They rose high in the sky seeming to punch a hole in the gray clouds above. We made our way around the northern edge of the lake and set up camp on a rocky ridge that gave us a great view of Banner and the lake. It was not quite 4pm, and having gone from sea level to 10,000ft in under 24hrs, I was exhausted! As we sat in camp, we watched several more groups arrive behind us. Farther up the shore we could see a group of 8-10 tents. 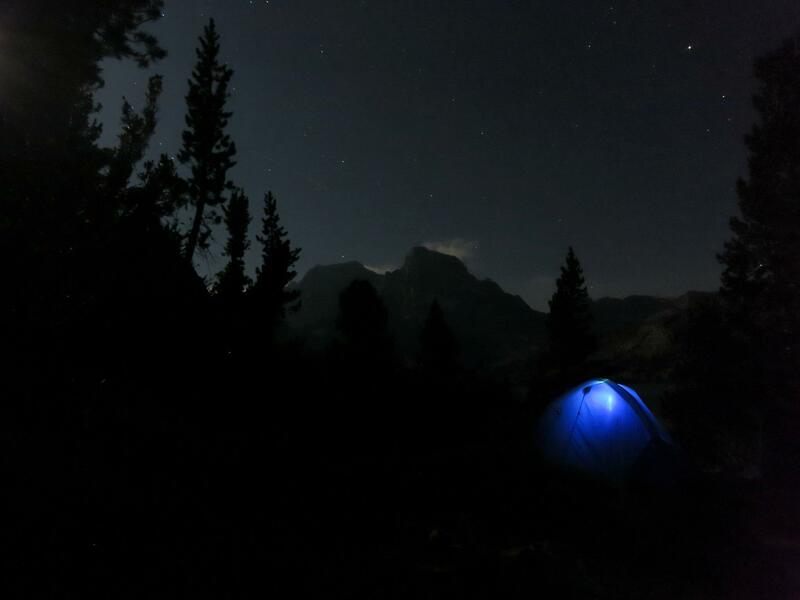 We wouldn’t be alone in the mountains tonight, but at least there was plenty of space and, best of all, no generators! As evening began to settle in, it was time for dinner. I had hoped to make a couple backcountry pizzas on this trip, but the fire danger in the Sierra was at the highest level in over 20 years making it unsafe to light up my twiggy fire. 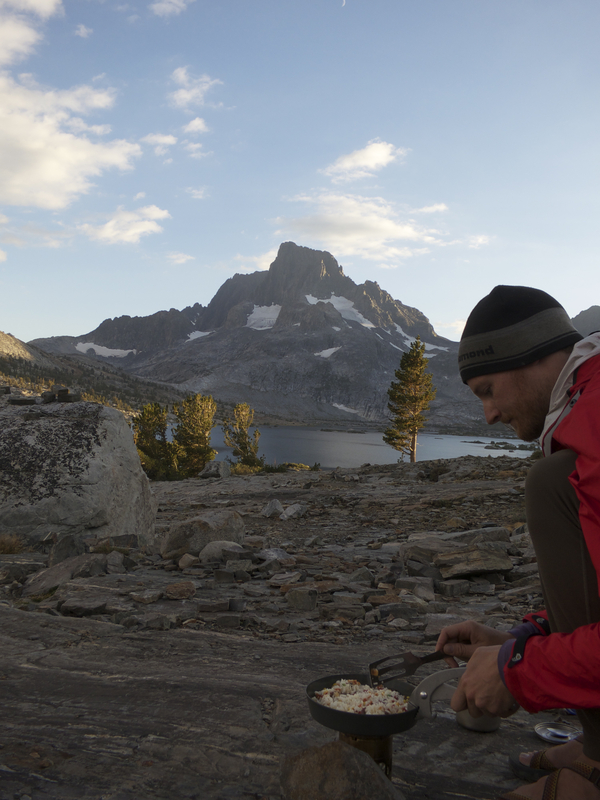 Instead I used my Fry-Bake to whip up an excellent dinner of stir fried rice in the shadow of Banner Peak! Over 3,000ft of climbing had made for a long first day, and by 8:30pm it was time for bed. 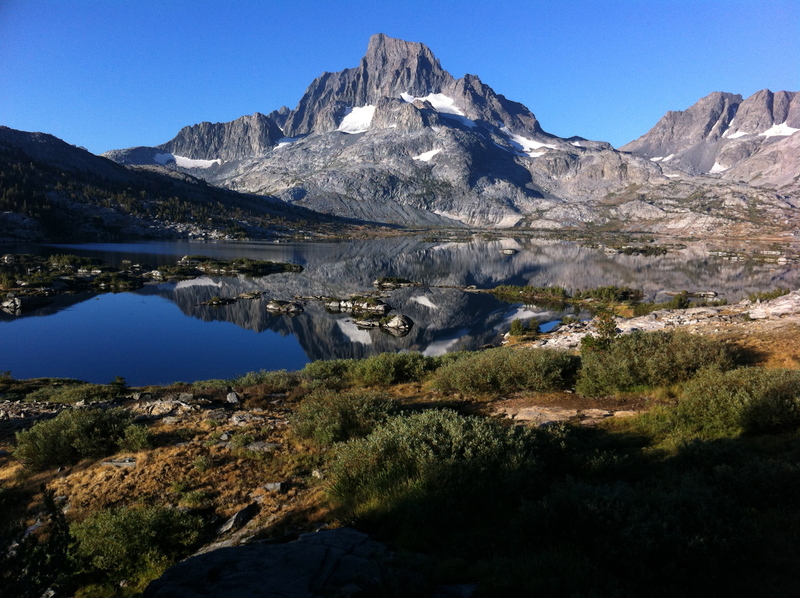 The next day we would be heading 7.5mi to Ediza Lake where we would set up base camp for climbing Ritter and Banner. Continue reading with Day 2 HERE!